If you have a dream to be a professional football manager, Top Eleven APK 4.1.5 is a game that you choose. From this game, you will have the opportunities to control, manage and even running your own club. Bring them from zero to hero by achieving some goals and target in a definite time. This is a game of soccer manager that is nominated to be the most played game for its lineup. Every player and skills are available to be tested, so you can have the best player to fulfill your team to be the best team all over the world. There are lots of aspects you can acquire from this game. It includes the way you improve the team progress. The entire team organization menus are available. 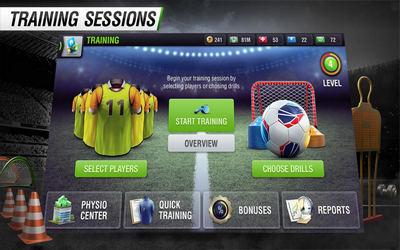 It contains the training session of the team, leveling up the team and even gets some bonuses. The presence of team members and formation are also offered and need to be managed properly. Besides, improving the winning strategies are available, so you can play your team with satisfactory. Large amount of players make you possible to live transfer and even bidding for a new high quality players. The player itself does not only have the physical training, but some improvement like motivation can also raise the team performance and achievement. As well as a team in the real world, you will have powerful stadium that can be customized. Create some development, so that the stadium can fit the need of your team. All the decisions you make are pretty tough. That is why you have to allow the performance of team along the debut. All the progress can be seen from the live matches. They are available every time your team has competition. Top Eleven for Android will give you the right and real experiences of a soccer manager journey. With this update we fixed various smaller bugs!